Inchamakinna is in the civil parish of Kilcummin. The civil Parish corresponds with the following Church of Ireland parish of Kilcummin, Galway West. In general, the civil parish and the Church of Ireland parish are the same as is the case in the Kilcummin Oughterard area. Civil Parish: Kilcummin View all place names in this civil parish. Description: An extensive island containing 108¾ acres. Situation: In Greatmans Bay near the shore of Kilcummin Parish. The Tithe Applotment Books are in a variety of formats, from a few pages sewn together to elaborately bound volumes. In most cases they are written in manuscript throughout, although some consist of manuscript entries on printed questionnaires. The information in the books is broadly uniform and generally includes at least the name of occupier, the size of holding, the valuation and the tithe payable. In some cases more detailed information is provided. Some volumes have maps and most have certificates and correspondence attached. The sub-divisions of the parish were recorded. Some of these subdivisions, such as ploughlands, ceased to be in official use after the six-inch survey of the Ordnance Survey was completed in the 1840s. Only productive land was subject to tithe, and the books usually distinguish between this tithable land and untithable land such as roads or mountains. Tithable land was in some cases classified by quality, and a money value was given to each class. In some cases, the proportion of tithe payable to the rector, vicar or lay proprietor of the tithes was set out. The column for observations was sometimes completed, with information about commonage, for example. In the Galway Library Website page for Inchamakinna; the men listed under the Tithe Applotment section have rented land on Erragh Island. 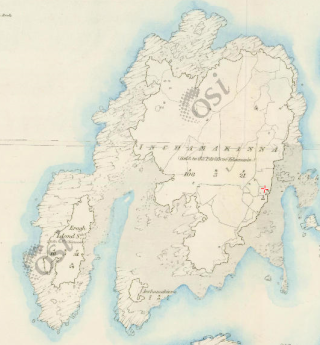 On Griffith’s Valuation: Inchamakinna, Eragh Island & one small island are listed together with a total area of 121 acres, 1 rood & 29 perch. Land valuation at £36 0s 0d & building valuation of £3 0s 0d. Total Valuation £39 10s 0d. “in fee”, meaning that the occupier is also the legal owner of the property. Note: Inchamakinna had an area of 108 acres, 3 rood & 21 perch. Total Valuation £33 0s 0d. This Information was found on the 1841-1881 Census. A town land is one of the smallest land divisions in Ireland. They range in size from a few acres to thousands of acres. Many are Gaelic in origin, but some came into existence after the Norman invasion 1169. Inchamakinna is a townland. 1881 – 1 house with 8 people (3 males / 3 female). There was 1 outbuilding. Total Valuation of Houses & Lands £33 0s 0d. 1891 – 1 house with 9 people (5 males / 4 females). There were 2 Outbuildings. Total Valuation of Houses & Lands £33 0s 0d. This is a return of the member of the family, their Visitors, Boarders, and Servants who slept or abode in their house on the night of 31st of March 1901 in Inchamakinna. There was 1 house listed in the townland of Inchamakinna. 12 (7 males/ 5 females) were all Roman Catholics. 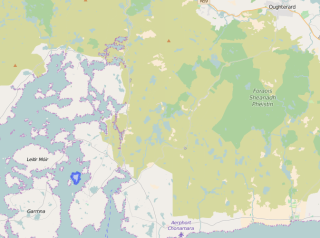 The people that lived in Inchamakinna were born in Co. Galway. There was a total of 1 farm buildings and out offices, a cow house. Class of House: The class of house depended on the materials used in the roof, walls, number of rooms and number of front windows. A 1st class house was considered the highest standard. Walls of the houses: The walls were of stone, brick, and concrete or of mud, wood or other perishable material. The house in Inchamakinna was built of stone, brick or concrete. There were no mud cabins. Patt McDonagh aged 55 was head of the family; married to Honour aged 45. They lived with their children Redmond aged 21, Bridget aged 19, Martin aged 17, Patt aged 15, John aged 13, Martin aged 11, Michl aged 9, Anne aged 7, his widowed mother Honour aged 92 & sister Eliza aged 50; single. Patt, Redmond, Martin, Patt, John, Martin, Michl & Anne were labourers. Honour (grandmother) & Eliza had no trade or profession, Honour (wife) was a housekeeper & Bridget was a servant. Patt (father), Honour (grandmother), Bridget & Martin (17) could read & write. Honour (wife), Redmond, Martin (11), Michl, Anne & Eliza could not read; Patt (son) & John could not read or write. Eliza was listed under specified illnesses as “Imbecile or Idiot nor no Good Sense”. The entire family spoke Irish & English. NOTE: There are 2 Martin McDonagh’s listed in the Household return. This is a return of the Members of families in Inchamakinna, their visitors, boarders and servants who slept or abode in the house on the night of Sunday the 2nd of April 1911. There was 1 family home with 6 males, 3 females a total of 9 persons living in the town land; all Roman Catholic. They had 1 farm building; a stable. Patrick McDonagh aged 70 was head of the family; married to Nora aged 52. They lived with their children Patrick aged 28, John aged 26, James aged 24, Kate aged 22, Michael aged 20, Anne aged 13 and visitor Martin Powell aged 27. Patrick (father) was a herd. Patrick (son), John, James & Michael were farm labourers. Anne was a scholar and Martin Powell was an Irish teacher. Patrick (father), Anne & Martin could read & write. Nora, Patrick (son), John, James, Kate & Michael could not read. John was listed under specified illnesses as “Imbecile”. The entire household spoke Irish & English. Patrick & Nora were married for 32 years; they had 9 children with 7 living at the time of the census. Inchamakinna is in the civil parish of Kilcummin. 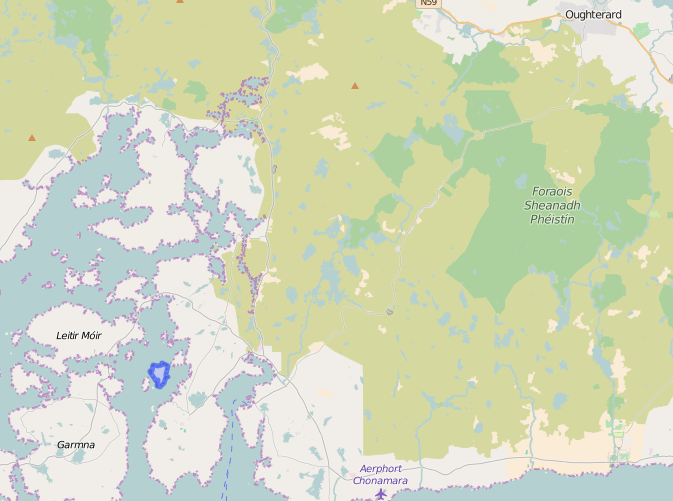 It is located at 53° 16′ 49″ N, 9° 37′ 12″ W.
Original OS map of this area. Ireland was first mapped in the 1840s. These original maps are available online. Information from the National Monuments Service. You can use this link to view a map of archaeological features. This link brings you to a website wherein you will have to search for your townland. This page was added on 04/08/2016.